Perched on one of the most exclusive beaches in north Sardinia, Capo D’Orso is the most prestigious five star hotel in Palau. With remarkable views over La Maddalena Archipelago, facing the island of Caprera and leading to the Costa Smeralda, this hotel comes close to none where scenery counts. Here, warm Mediterranean breezes compliment the pretty surroundings of olive trees and junipers, creating a fresh and luxurious environment for holidaygoers. Two beaches (one with sunbeds) await guests among sundecks, an outdoor swimming pool and exclusive spa, while a short stroll uncovers the hidden coves surrounding the hotel. Guests can discover the underwater wonders during a guided dive in the crystal blue waters of the sea, or soak up views of the spectacular mountains of the north of Sardinia from the beach. Sample the finest in Sardinian cuisine at one of the hotel’s two restaurants and end a perfect evening sipping an expertly made cocktail in the wonderfully ambient Piano Bar. The hotel has 86 rooms. Sovereign does not accept children at this hotel, however this is not an adult-only property. Subtle refinement is the theme for Il Paguro Restaurant, where guests can enjoy a buffet style breakfast on an outdoor terrace, to the soft sounds of a harpist. 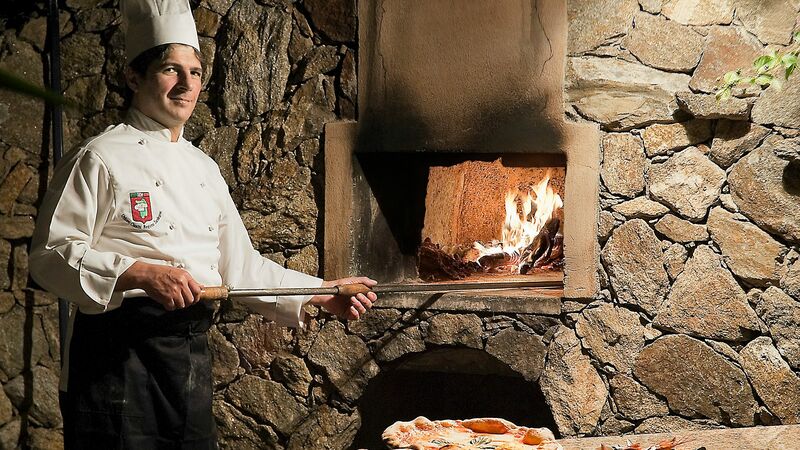 Exceptional á la carte dishes from Gallura are presented perfectly, accompanied with famous wines, selected by a sommelier. Il Paguro serves an exquisite selection of Sardinian specialties and guests can choose seafood options from the shellfish aquarium. Included with Half Board. Opening of the restaurant is weather dependent. The dress code is smart casual: gentlemen are required to wear long trousers during the evening. Centuries old olive trees surround this beautifully elegant and romantic restaurant, serving a truly inspired cuisine, influenced by local fresh produce. Guests on half board will receive a buffet dinner at this restaurant. Gentlemen are required to wear long trousers during the evening. Perfect for a sunset cocktail, L’Approdo serves sandwiches for lunch and delicious wood-fired pizzas, Mediterranean dishes and salads for dinner. Facing the beautiful La Maddalena Archipelago and the Costa Smeralda, the Pizzeria has a calming and natural ambience, ideal for a relaxing evening. 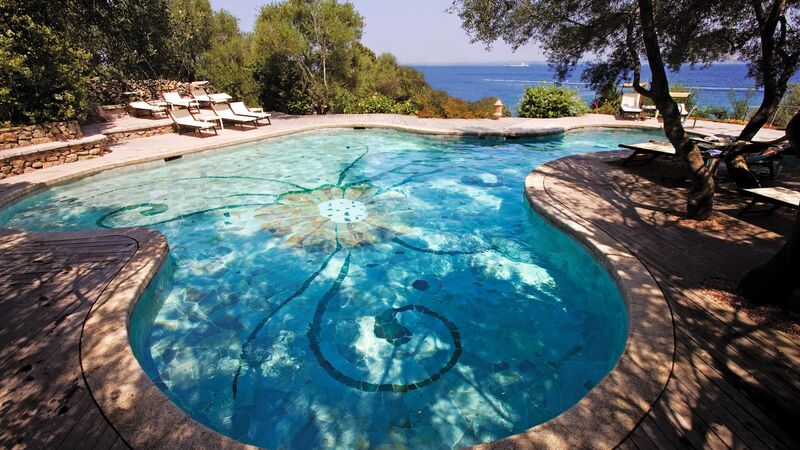 The intricately designed mosaic pool offers stunning ocean views, complete with wooden decking. There are three outdoor thalasso pools at the spa. 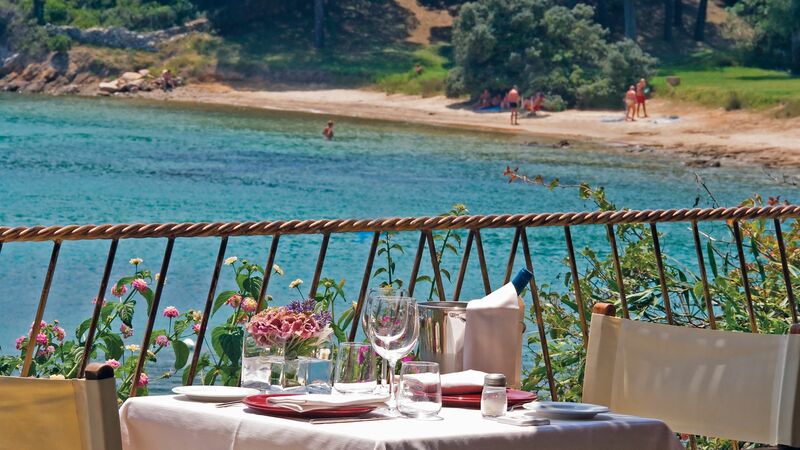 Capo D’Orso Thalasso & Spa is perfectly positioned next to two spectacular beaches. Cala Selvaggia is a romantic and exclusive bay, surrounded by green paths and hammocks, while Cala Capra is a phenomenal clearwater beach just below the hotel, surrounded by unspoilt views and with soft sand running smoothly down to the sea. 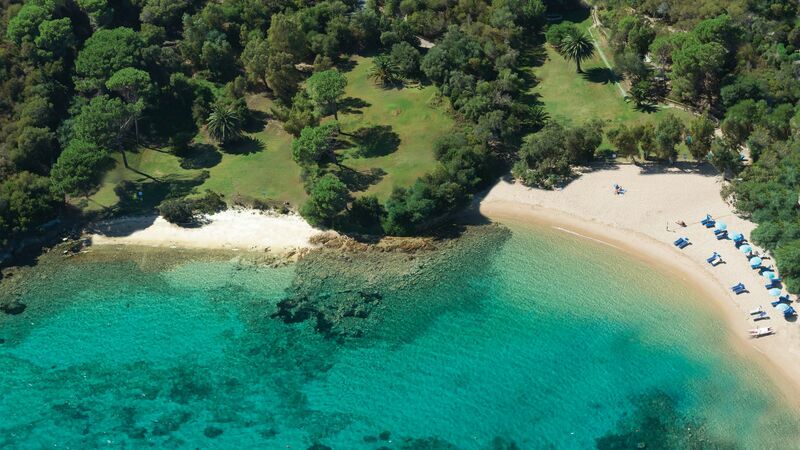 Both beaches are a short walk from the hotel and are beautifully enclosed with trees and shrubs. Embark on a unique sensory experience at The L’Incantu Thalasso Wellness Centre & SPA, which is surrounded by nature-shaped granite rocks. The Spa offers three outdoor seawater Thalasso pools with hydromassage water-jets for the ultimate rejuvenating experience. An impressive jacuzzi, Turkish bath and relaxation area featuring sun loungers and therapeutic herbal teas are also on offer, along with 10 chalets for Thalassotherapy treatments and massages. Enjoy a quiet game of golf on Capo D’Orso’s nine hole Pitch and Putt golf course, putting green and practice course. Ideal for newcomers and experts alike, guests can enjoy the beautiful Sardinian warmth over a game. The Hotel Capo D’Orso boasts a stunning beach of soft white sand just moments away on foot, perfectly sheltered from the wind. The Cala Selvaggia, famed for its romantic atmosphere, is only a few steps away and through a short passing is the phenomenal sparkling Sardinian sea, dotted with hammocks. Santa Teresa Gallura, another dazzling white sand beach with hidden coves and creeks, is also nearby. The hotel is within easy reach of the gateway to the charming Maddalena Archipelago, a National Park island with white beaches and bright blue waters. For a view more rustic and unbeknown to tourism, remote and rugged landscapes can be found a short walk away. Still, there is more to discover in the magical North Sardinia - the famed Costa Smeralda, a glamorous side of the east coast, is home to coffee sipping yachters, a stunning marina and spotless bays. 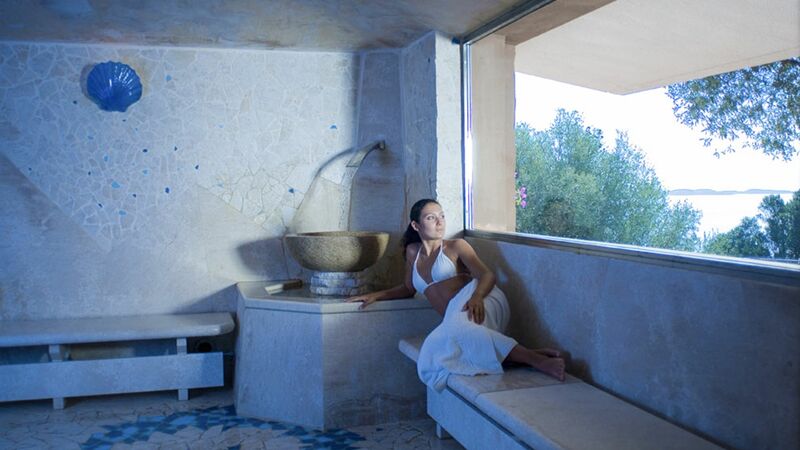 Capo D’Orso Thalasso & Spa is 40 minutes from Olbia Airport. Classic Double Rooms are tastefully furnished in a typical Sardinian style. They feature a double bedroom and have a terrace or balcony with a small table and chairs. Please note the image used is of a Classic Sea View Room. Classic Sea View rooms are tastefully furnished in a typical Sardinian style. They feature a double bedroom and a terrace or balcony with a sea view and a small table and chairs. Deluxe Sea View Rooms are tastefully furnished in a typical Sardinian style. They feature a double bedroom with an open plan living area with a single sofabed and a terrace or balcony with sea view. Junior Suites with Sea View are tastefully furnished in a typical Sardinian style. They feature a bedroom with a double bed or twin beds, an open plan living area with a single sofabed, a larger bathroom and a separate WC, and a terrace or balcony with sea view. Family Suites feature a double bedroom, open plan living area with a single sofabed, separate twin bedroom, two Sky TV's and a large bathroom. 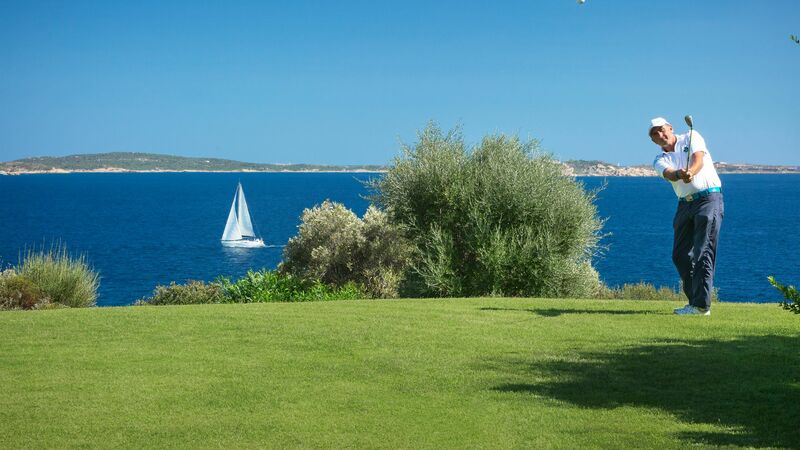 Junior Suite Executive with Sea View are tastefully furnished in a typical Sardinian style. They feature a large bedroom with a king-size bed or twin beds, open plan living area with two single sofabeds and a large bathroom. Junior Suite Cardinal with Sea View are located just 30 metres from the sea and have direct access to the Wellness Centre. They feature a double bed (twin beds on request only), open plan living area with two single sofabeds, a large bathroom and a secluded terrace. My stay at Capo d'Orso was incredible. We stayed in a room with a marvelous view and elegant decorations. The staff of the Hotel and of the restaurants were kind and extremely helpful throughout. The beautiful restaurants were the cherry on top; we had a lunch of raw seafood and lobster pasta sitting in the wonderful restaurant on the platform by the sea. We also loved the activities; we were able to jog in the open-air gym overlooking the emerald sea of Sardinia and join yoga classes in the middle of the mediterranean forest. This hotel has been suggested by Italian friends from Milan, it was the first time in Sardinia for me and my wife and we were looking for a romantic escape to relax and enjoy the end of the summer. We greatly appreciated the location, the view from our room and the old style warm friendly hospitality which you only find in Italy. When you arrive and you depart the General Manager greets you, all staff members are smiling and professional, the food is amazing and even when the hotel is full you can still have privacy and space to fully enjoy this magic setting. We will definetely come back and will suggest it to our friends. Thanks a lot and arrivederci !! My husband and I stayed in the Capo D'orso for six days at the end of July this year. This hotel is located in a beautiful and stunning location. The hotel is run by a very friendly and efficient team of staff led by the General Manager Mario. Mario is one of the hardest working managers we've ever come acrossed, he seemed to work 24/7 and was always on hand to help the guests whenever is needed. The rest of the staff were just amazing, they were just so helpful and nothing was too much trouble. From the first day of our arrival to the day we left, we were always made to feel so much at home. To say the least, we were just simply spoiled. The entire hotel was spotlessly clean and our room had a balcony which opened up to a spectacular sea view. The grounds were so beautifully landscaped which make you feel in absolute paradise! Our daily breakfast was delicious, a large selection of good quality display of fresh fruits, yogurts, freshly baked bread, cakes and pastries, just couldn't have enough of the scrumptious miniature custard filled donuts plus many hots and cold dishes. The standard of food in all three restaurants were high. Needless to say the service provided by the restaurants staff was professional and very attentive. We did venture to eat out the first couple of evenings, but had decided the food at the hotel was much better without the hassles of traveling. We would like to take this opportunity to thank Mario and his wonderful team of staff for an excellent holiday in tranquility. We are looking forward returning in the years to come. Cheers!! We celebrated our 15 year anniversary with our children (aged 10 and 12) at Capo D'Orso and could not recommend it more. The service was excellent, starting with the hotel manager whose hospitality and kindness was reflected in all that followed. He went out of his way to greet us and ensured we were taken care of in a genuine way which made our experience even more special. 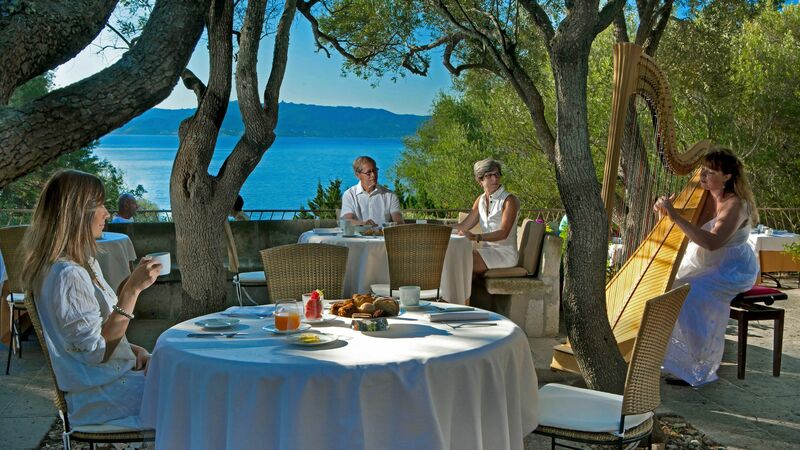 The location is fabulous and restaurants superb - in quality, privacy and view. I also appreciated that the staff was accommodating and considered our needs (we arrived late on Friday night and they offered a light dinner for us) without being overbearing and that the room had items like beach bag, beach shoes, beach towels, which were came in handy. Our children also loved the property and its secret hideaways. We stayed only three nights and which we were there for a bit longer! Special location for a special and memorable occasion. Just back from a week on half board staying in room 405 with fluctuating views of the place. Picked up in a fantastic S Class Mercedes for the hour long transfer in luxury. No welcome drink, though registration was very efficient and weirdly no c/c imprint taken! Spacious light and airy room with a large balcony overlooking the bay was great with a super shower but no bath. We had a kettle (though other smaller rooms don't) but milk often not renewed and they charge 2 euros for water and no fruit, tv had just 2 English speaking channels, this isn't our experience of 5 star hotel features. Grounds are great, superb views close to the sea, with private nooks and shade everywhere, loads of sunbathing beds, a small private beachy cove, a huge picturesque and under used swimming pool over the small road. The 9 hole pitch n putt is prohibitively over priced at 40 Euros, not too well tended, with a useless putting green and 20 yd netted driving range, didn't see anyone playing and I don't blame them. It is a remote location with nowhere to walk to and we were quoted 150 Euros for a return taxi to Porto Cervo, though a car is recommended by all sources, and the shuttle to Palau (8 euros return) is well used and worthwhile for a change. The staff are mostly efficient, friendly, smart, and add value. The food offering is on the whole very good, and on half board you choose which restaurant to use in the evening. We used all 3. We ate our first 5 breakfasts on the terrace but eventually were worn down by the wasps and moved inside. The breakfast was perhaps a bit disappointing, no fish, french toast, beans, burgers, hash browns, corned beef hash, the same fayre throughout our stay, and although a buffet, any egg products have to be ordered and delivered by waiter which you then go and add to yourself...delays and irritating. The terrace in the evening is buffet with a wide choice and quantity no issue. The Pizza place was vastly over hyped, basic pizza's and not notable in quality . The main restaurant is fantastic. Service tremendous, quality and choice of food brilliant, marvellous setting. Wine expensive and 16 euros a pint of beer!! Looked at the Spa but didn't seem to be good value for money or anything special so gave it a miss, like most, we saw only 4 people in the outdoor pools throughout. There was live music which we heard but didn't support apart from the breakfast harpist, ok, not intrusive apart from one night in the restaurant...screechy. Wifi was good, and our final holiday barometer of many years is how much is a Ice Cream Magnum...all self serve ice creams from the freezer cost 4 euro's! !